From the label's inception in 1990, Reinforced records came to define one of the golden periods of UK dance music with a completely fresh and previously unexplored application of breakbeat science with recently democratised technology for a generation exposed to Rave culture. 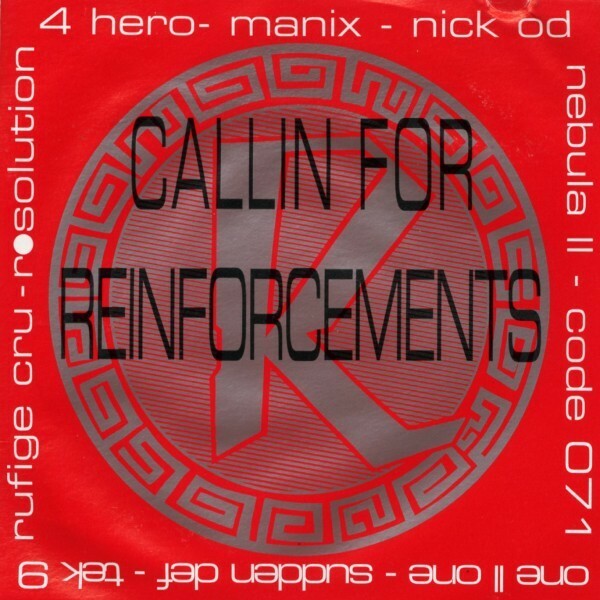 'Calling for reinforcements' was one of the label's earliest CD releases and compiled a selection of deadly dancefloor experiments from the likes of label head Marc Mac in his Manix and 4 Hero guises, through to the first productions from Goldie in his original Rufige Kru. It would be fair to say that nearly every track here is a bona fide classic to anyone with even a remote interest in early 'ardkore, from Nebula II's brutal anthem 'Athema' to paranoid dancefloor staple 'Mr Kirk's Nightmare' from 4 Hero or the sample happy 'Have you got anymore spam?' from Nick OD, perfectly epitomising the genre clashing techniques and sense of humour that came to define the era. This is the first time the collection has been available in any format since it's release way back in '92 and should hopefully serve to educate a whole new generation of digital fiends in the arcane ways of the rave. Absolutely ESSENTIAL!! !